Weather was perfect (excellent visibility, 17 degrees C and a light breeze) when Flash Air flight 604 departed the Red Sea resort of Sharm el Sheikh for a flight to Paris-CDG with an intermediate stop at Cairo. On board were 135, mostly French, holidaymakers who were heading home. At 04:38 the flight was cleared to taxi to runway 22R for departure. 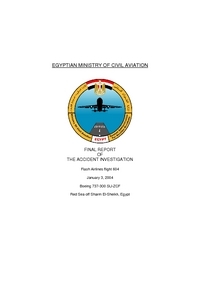 After takeoff, at 04:42, the plane climbed and maneuvered for a procedural left turn to intercept the 306 radial from the Sharm el-Sheikh VOR station. When the autopilot was engaged the captain made an exclamation and the autopilot was immediately switched off again. The captain then requested Heading Select to be engaged. The plane then began to bank to the right. The copilot then warned the captain a few times about the fact that the bank angle was increasing. At a bank angle of 40 degrees to the right the captain stated "OK come out". The ailerons returned briefly to neutral before additional aileron movements commanded an increase in the right bank. The aircraft had reached a maximum altitude of 5460 feet with a 50 degrees bank when the copilot stated: "Overbank". Repeating himself as the bank angle kept increasing. The maximum bank angle recorded was 111 degrees right. Pitch attitude at that time was 43 degrees nose down and altitude was 3470 feet. The observer on the flight deck, a trainee copilot, called "Retard power, retard power, retard power". Both throttles were moved to idle and the airplane gently seemed to recover from the nose-down, right bank attitude. Speed however increased, causing an overspeed warning. At 04:45 the airplane struck the surface of the water in a 24 degrees right bank, 24 degrees nose-down, at a speed of 416 kts and with a 3,9 G load. The wreckage sank to a depth of approx. 900 metres. CONCLUSION: "No conclusive evidence could be found from the findings gathered through this investigation to determin the probable cause. However, based on the work done, it could be concluded that any combination of these findings could have caused or contributed to the accident. Although the crew at the last stage of this accident attempted to correctly recover, the gravity upset condition with regards to attitude, altitude and speed made this attempt insufficient to achieve a successful recovery." Distance from Sharm el Sheikh-Ophira Airport to Cairo International Airport as the crow flies is 374 km (233 miles).